Deposit Methods: Bank Draft/Cheque, Bank Wire Transfer, EcoCard, Moneybookers, NETELLER, CLICK2PAY, MasterCard, Visa, WebMoney. Languages: English, Chinese, Simplified Chinese. 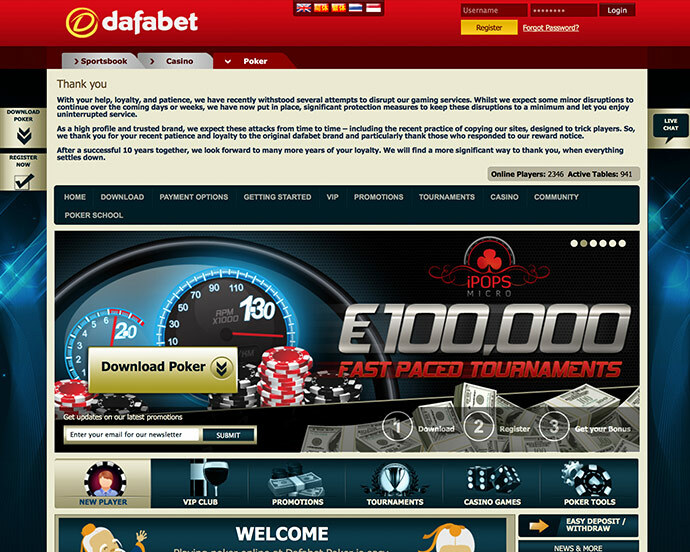 Dafapoker is a prime Asian-based online poker room site with thousands of customers around the world. It is dubbed by many as one of the best online poker rooms in the industry, providing highly-interactive online poker software topped with round-the-clock customer support. It is a fully-licensed gallery of the leading poker rooms and tournaments operators in the web. Operating since 2004, Dafapoker has been providing online poker players a worry-free product and state-of-the-art gaming environment. It guarantees customer satisfaction with a challenging, distinctive online betting environment and a wide range of unrivalled promotions and events. At Dafapoker, your satisfaction is top priority.